Trump Logic 101: I Never Said Give Teachers Guns, I Said Give Concealed Guns To Gun-Trained Teachers - Joe.My.God. President Donald Trump lashed out at media coverage of his proposal to arm some teachers by denying that he ever made it. 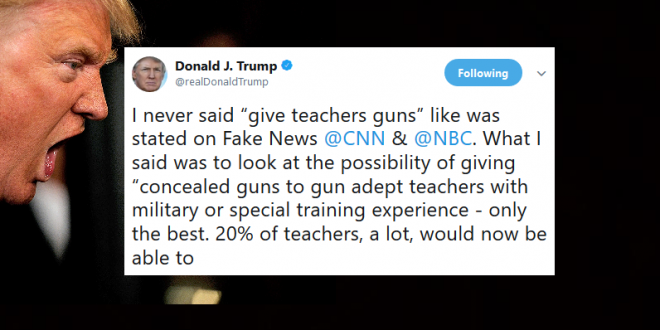 “I never said “give teachers guns” like was stated on Fake News CNN and NBC,” the president wrote on Twitter. However, Trump then seemed to undercut his own point by saying that some teachers should actually be armed. The president also said that armed teachers would “serve as a deterrent to the cowards that do this” — and he said that arming teachers would be a much cheaper option than paying for armed guards.